a stunning sight from the train as we traveled from tokyo to hamamatsu on tuesday. a beautiful, clear day offered a great view of mt. fuji. 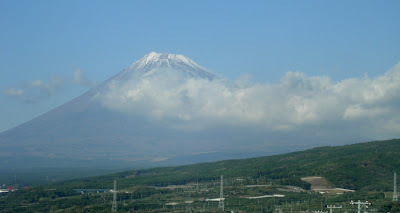 the japanese saying goes, "a wise man climbs fuji-san once; only a fool does it twice." that makes me feel somewhat better about not climbing fuji during our stay in japan. this, from japan-guide.com, also makes the decision easier: "from october to around mid june, climbing to the summit is highly perilous due to extreme wind and weather conditions, snow, ice and a high risk of avalanches."